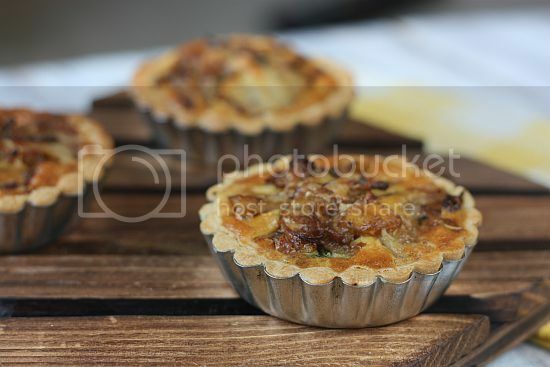 I have always had a thing about tarts ever since I first started to bake and blog in 2008. Imagine an empty tart shell and the number of possibilities! It is like handing out an empty canvas to a painter! I love baking both savoury and sweet tarts, but I think the preference is steered more towards a savoury tart because it was very much enjoyed by my dearest LT who passed on last year! Whenever I do make tarts, I would do small ones instead (simply because they are easier to serve and no messy cutting) and I would also tend to make extra shells. I would keep the unbaked shells in my freezer and they could be sitting around for a few weeks or even a month before I have the urge to make something of them. If you have unexpected guests who could just turn up at your door step, you then have something you could easily put together and feed them! Thankfully I don't have unannounced visitors of this nature. Well, this particular recipe is a savoury tart. You guessed it! I had unbaked frozen tart shells just sitting in my freezer. Plus half a bag of potatoes - hurray for this! 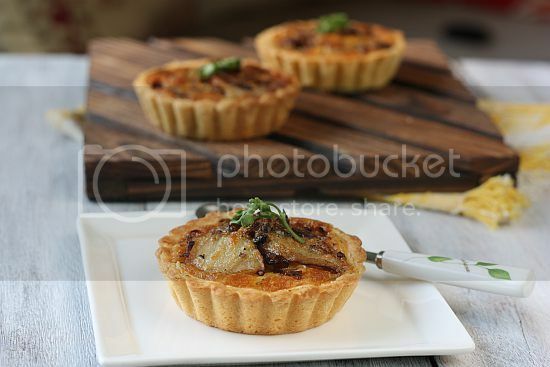 Prior to posting I have already made this savoury tartlet on three separate occassions and I guarantee that you would be making it again too if you have tried it. For variation, you could add some bacon bits to give it an extra smokey taste. Hmmm just writing this post already makes me want to whip up another batch! 1) Sift flour and salt into a bowl. 2) Add in the butter. 3) Using a pastry cutter, cut the butter into the flour until it resembles rough breadcrumbs. 4) In a separate bowl, lightly beat the egg with the milk and drizzle it onto the flour mixture. 5) Using your hands, blend the mixture together and lighly knead to bring together. Try not to handle the dough too much. 6) Roll the dough into a ball, wrap in plastic wrap, flatten it into a disk and chill for about 45 minutes to an hour. 8) To line your tart tray, I find it easier to roll the dough between two pieces of clingwrap plastic. Roll to about 3" wider than the base of your tray. Remove the top wrap. 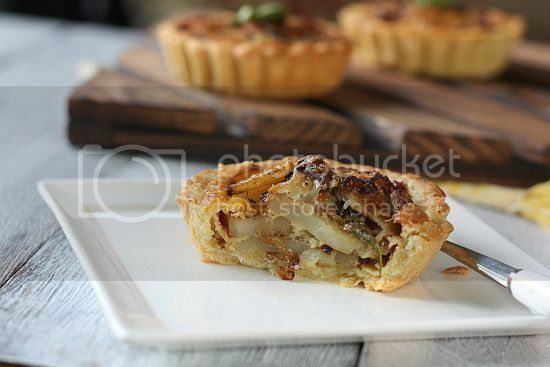 9) Lift the dough using the clingwrap plastic and gently flip it into your tart tray. Press the dough onto the tray and trim off the excess. 10) Dock the base of the tart shell with a fork and then place it into the fridge for another hour. 11) Preheat oven to 190C. Bake the shell blind, for about 15 minutes. Then remove the parchment paper and bake for another 5 minutes. Remove from oven and let it cool before pouring in the filing. You can also use your food processor. Just whisk the dry ingredients first. Then drop in the cubed cold butter into the processor. Pulse until the mixture resembles rough breadcrumbs. Then slowly add in the egg and pulse until the dough comes together - do not overdo this otherwise your dough will be very hard. 1) Grease the tartlet molds with removable base with oil spray or butter. Line the molds with Pate Brisee pastry. Trim off excess pastry and roll it back into a disk. Refrigerate pans for 20 minutes. 2) Then heat butter in a large non-stick frying pan over medium heat. Add the onions and cook for 15 minutes. Add the brown sugar and potatoes and cook for a further 10 minutes until the mixture is caramelised. Stir in dried mixed herbs, fresh herb, salt and pepper and set aside to cool slightly. 3) Preheat oven to 180°C. Place parmesan, egg and cream in a bowl and whisk to combine. Divide the potato/onion mixture between the chilled tartlet molds. Then spoon the egg mixture over the potato/onion. 4) Bake for 20 minutes or until set and golden on top. Serve warm or at room temperature. 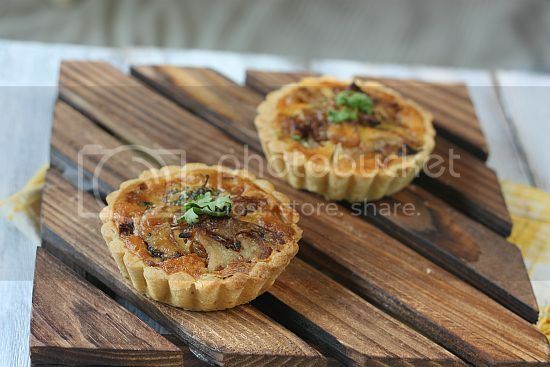 Those mini quiches look mouthwatering! Love the caramelised onions. 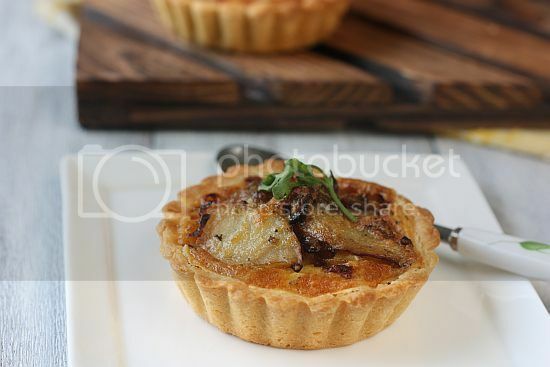 Caramelized onions is possibly one of my favourite pizza or tart vegetable fillings. Very rustic and comforting. 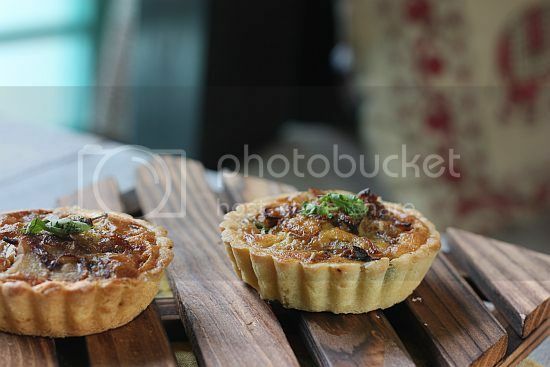 These tarts look gorgeous and I think your photography now is really top-notch :)! i love caramelised onion, i must try this one day. Thanks for sharing. Oh, so yummy! Looks really good! It's such a nice savoury combination!